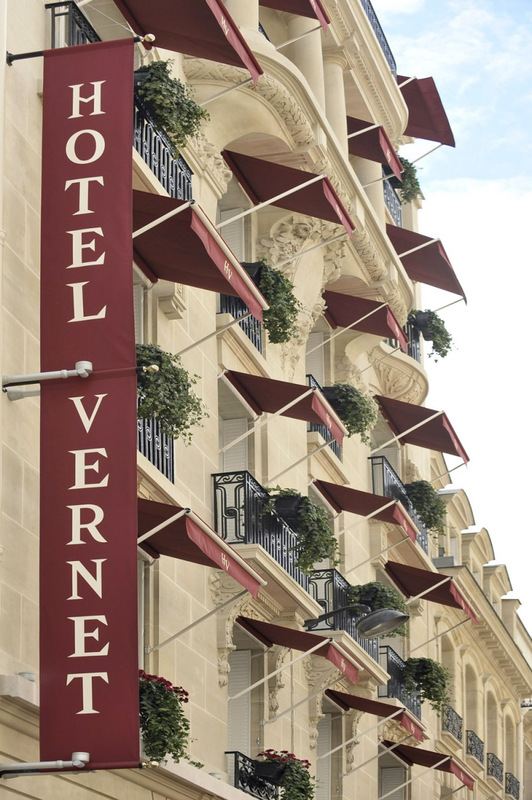 The Hotel Vernet, which turned 100 in 2014, has undergone almost as spectacular a renovation as Paris did under Baron Haussmann’s direction, a movement that began in 1854 and of which this hotel emerged in the aftermath, adopting a stylish clean limestone facade and black ironwork balconies, typical of the period and specially designed by architect and hotel designer Albert Joseph Sélonier. This hotel was bought out by Jousse Besse Signature, a family-run hotel brand. 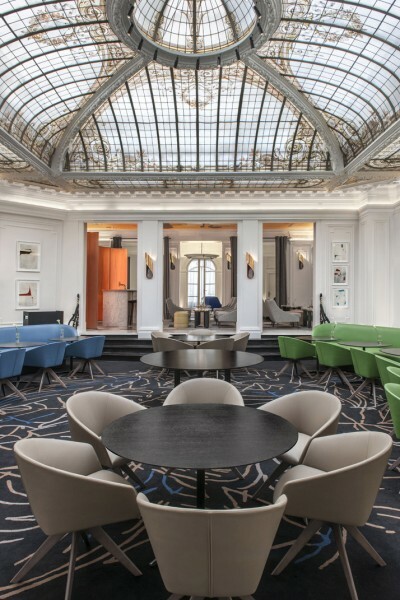 After already transforming the Bel Ami Hotel on Paris’ left bank, the family decided to transform this historic landmark structure, located only a stone’s throw from the prestigious Champs Elysees avenue. 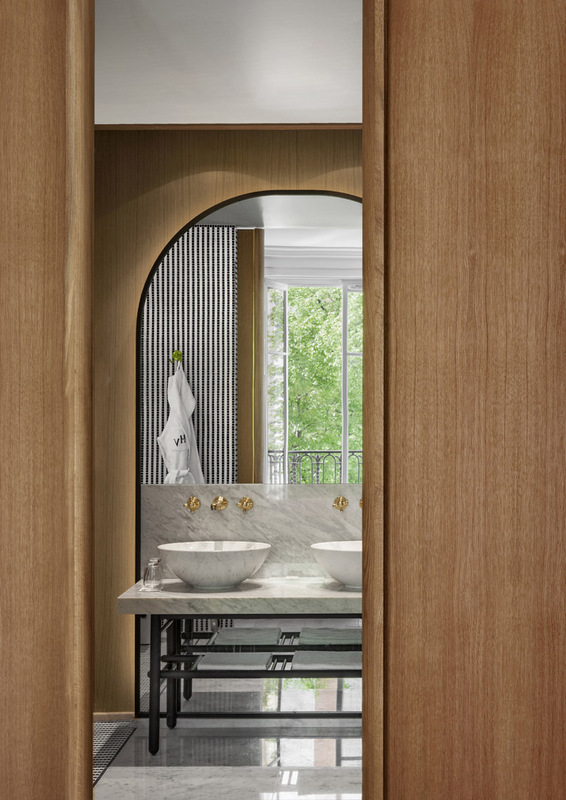 To carry out this major overhaul, the family called on Marseille-born interior architect François Champsaur, known for his attention to detail. Champsaur has successfully transformed the once traditional interiors and hotel design into a contemporary haven of art, color and luxury. 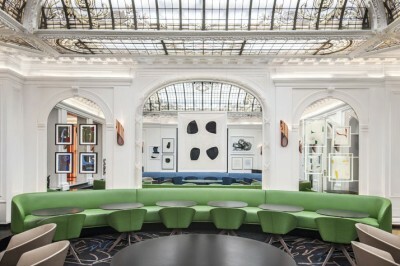 Champsaur is a genius when it comes to transforming space and artfully played with light and volumes, adding warmth and beautiful details – stylish copper, individually-lit room numbers on small steel pedestals in the hallways; white/blue lacquer writing desks in the bedrooms; floor-lamps with watercolor paper shades, ceramic coffee tables, poufs and a deconstructed marble bar to name only a few. 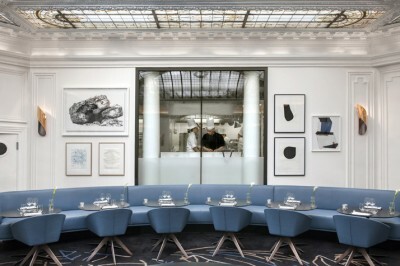 Champsaur even designed blue and white geometric bed linens. 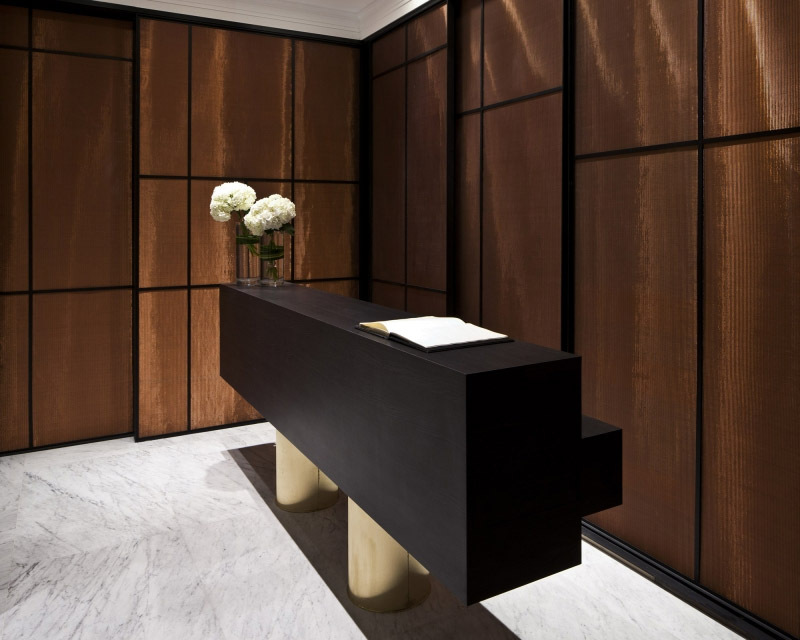 He has seen to every last detail in order to blend artistic and aesthetic luxury into the hotel interior design! 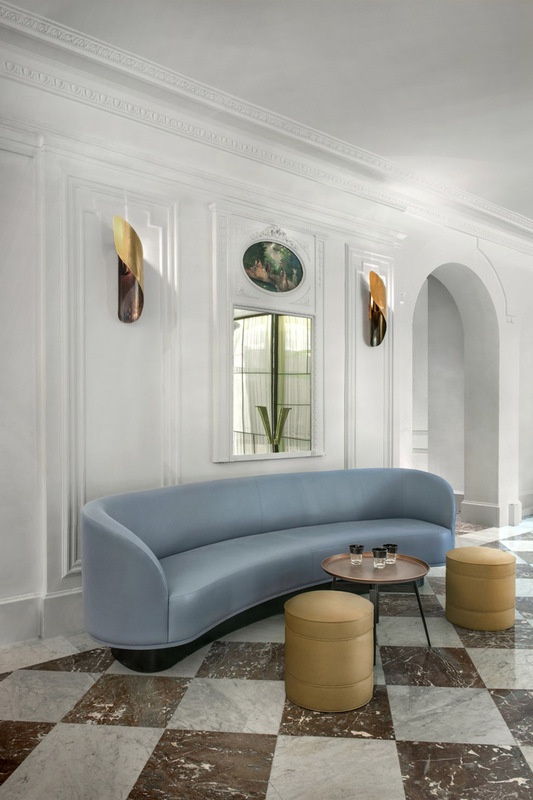 The entrance hall sports Carrara marble flooring, while abstract carpet and blue arm chairs and a blue leather bench will comfortably seat guests in the reception area. And that is just the beginning. 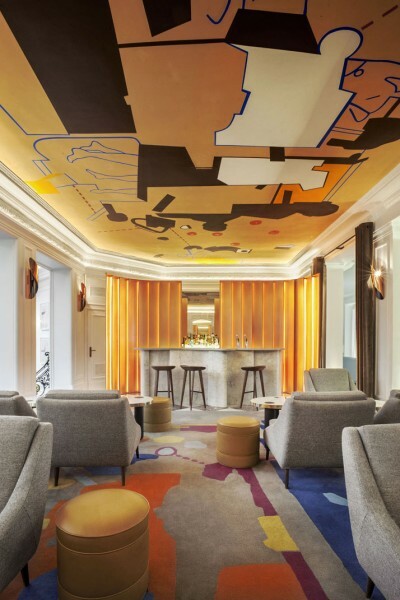 Chapsaur commissioned French visual artist Jean Michel Alberola to paint a fresco on the bar’s ceiling; Alberola also designed the bar’s geometric carpet. 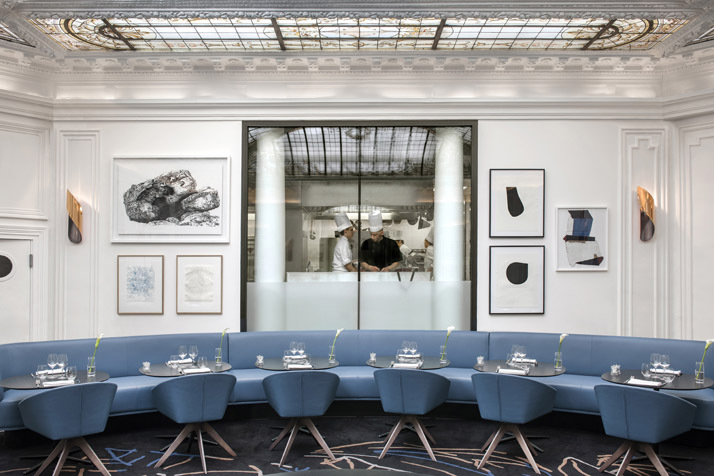 In the hotel restaurant we find minimalist but comfortable dining furniture designed by Champsaur himself and contemporary pieces of art beneath the breathtakingly gorgeous stained-glass dome built by Gustave Eiffel, a monument in itself. 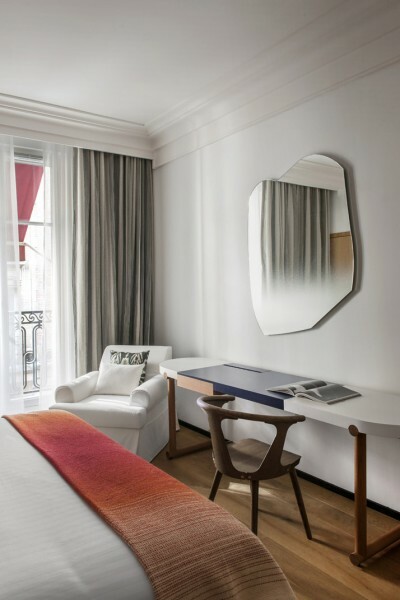 The rooms are all sumptuously appointed with quality furniture and design details in warm tones and colors that help procure such a homey feeling that some have made this their home away from home. 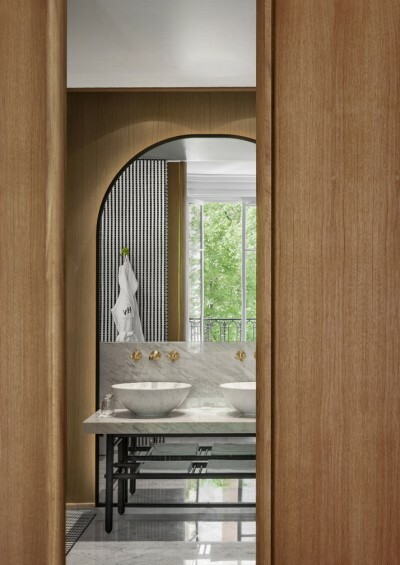 The bathrooms are spacious and offer beautiful oval marble vask sinks on marble counter-tops with crude solid brass faucets and marble floors. The Jousse Besse family and Champsaur have left no detail unattended in this hotel’s interior design. 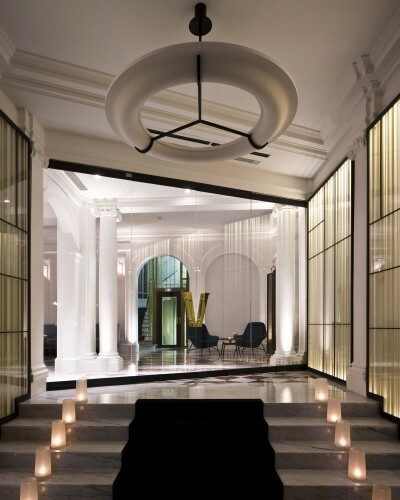 A absolute delight for all the senses!